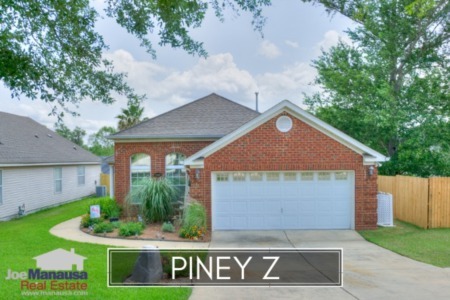 As a very active "newer" neighborhood in Tallahassee, Piney Z offers great choices for people who want easy access to Tallahassee and Tom Brown Park. With 31 homes sold and closed thus far in 2014, this popular NE Tallahassee community is poised to have one of its best (if not the best) years going back 8 years. 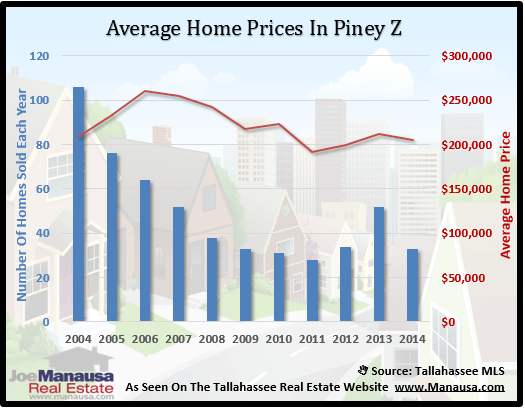 In our report, we will look at prices, values, and sizes of homes in Piney Z, as well as show current listings in the Tallahassee MLS and all closed home sales going back to 2002. In the three real estate graphs found in this report, we report the number of closed home sales for each year (blue bars, measured on the left vertical axis), and a key housing statistic shown in red (measured on the right vertical axis. In the graph above, we see that the average price for homes sold this year is currently at $206,000, and the number of homes sold is on pace to be one of the best in the past 8 years. It's fairly obvious that low prices (near an all-time low) is drawing buyers back to this neighborhood, where existing homeowners held strong to their pricing for many years, holding back all but the most insistent buyers. From 2004 to 2011, every year brought fewer and fewer buyers. This is the only neighborhood that I have seen where sales declined every single year during that time span. 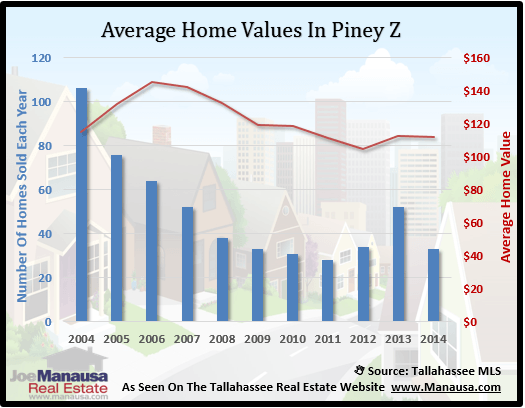 Our next graph shows that there has not been much of a rebound on home values in Piney Z. I believe this is mostly due to the fact that home sellers held on and Piney Z showed less depreciation than did most Tallahassee neighborhoods. Currently, the average price per square foot of a home sold in Piney Z in 2014 has been just under $112 per square foot. 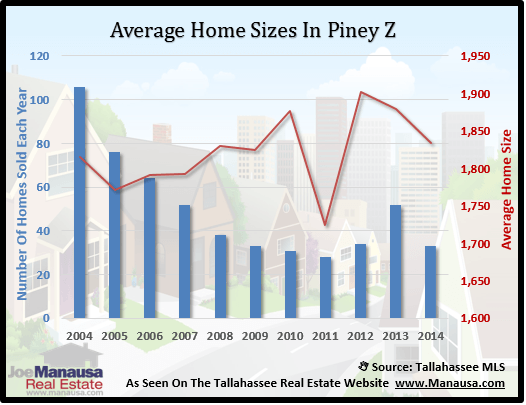 The average size of Piney Z homes typically ranges from as little as 1,700 square feet to as high as 1,900 square feet. This is a fairly tight range, much more so than you will find in Tallahassee's mostly non-uniform neighborhoods. The average size of a home sold in Piney Z this year has been 1,850 square feet. This is similar to other neighborhoods in Tallahassee, where the larger homes have been selling. 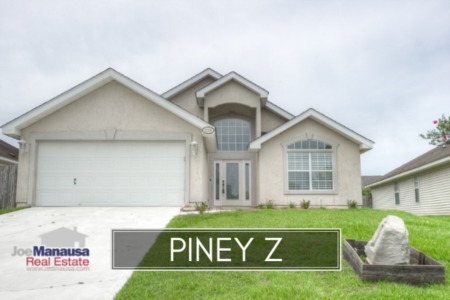 The following list of homes are the most recent listings in Piney Z. The following list shows home sales going back to 2002 in Piney Z.
I hope you enjoyed our September 2014 update on home sales in Piney Z, please feel free to drop me a note if you have questions not covered in this report.